Have you been feeling that you need some extra support for your lower back when sitting down? Does your lower back ache when sitting? What you can do is use a good lumbar support cushion. To gently push into your spine to help you relax your posture muscles from excess tension. However, which one should you choose? I’ve looked at different options for you to help you find the perfect one for your situation. Below you will find three products I would recommended. 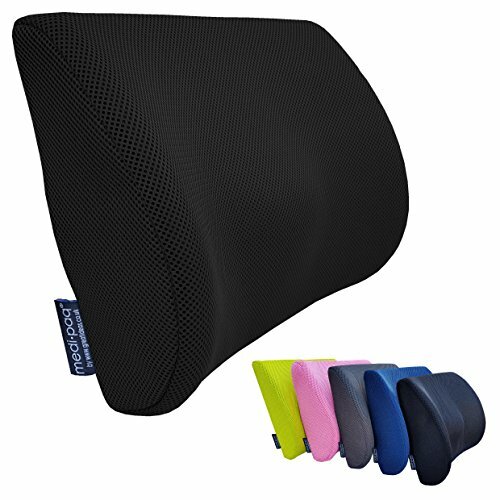 This should help you if you are in the market looking for which is the best back support cushion to buy no matter your budget. The Medipaq 3D Lumbar Cushion is a well designed back support cushion. The Medipaq is made from memory foam (a.k.a visco-elastic). You might know I’m a big fan of memory foam pillows. The same goes for lumbar supports made from memory foam. They are comfortable to sit against and feel supportive on the spine and muscles. It is intersting to see the manufacturer states the density of their memory foam being 4lbs. The cushion has the typical lumbar lordosis curve you’d expect, but, with an added bump. This unique feature appears to give a little extra focal point of support. This is to enhance the support feeling directly over the mid-lumbar region where our lordotic curve is at the deepest point. Memory foam can feel hot to sit against for a long time. Some users might feel it is not forgiving enough or too large for smaller frame people, like petite females. The Medipaq 3D back cushion is available to buy on Amazon here . The McKenzie lumbar rolls are very well designed to help lower back pain. The McKenzie cushion range has four product options. I feel, for most people, the best option is to go with the McKenzie super roll. If you need something that is firmer or longer then one of the other three would be a good choice. The Super roll is designed to fit nicely in most kinds of backed seats, like a mobility chair. It should fit snuggly in the lumbar region when leaning back on it. It has a flat edge so that it doesn’t roll up and down easily in a chair, once you’ve placed it at your desired height level. If you have been told you have a more pronounced lumbar lordotic curvature, then you might be better to go with the D-Shaped roll. This option has a deeper 13cm vs the 6cm depth compared to the Super roll. Take note that the 4 inch & 5 inch rolls are circular and don’t have a flat side. I feel these circular rolls are good for using on a sofa, or, if you need even more depth. Made from standard density foam not memory foam. Can be confusing which option to choose. 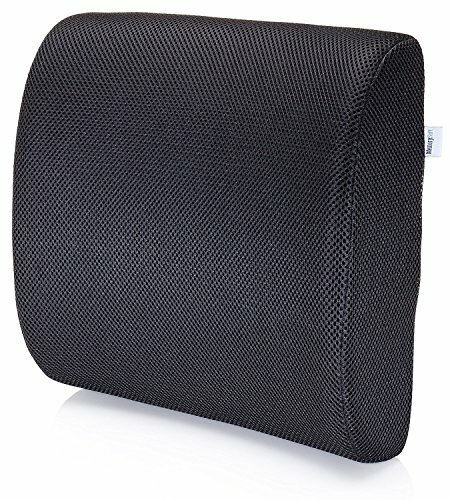 The McKenzie Super Lumbar Roll is available to buy on Amazon here . 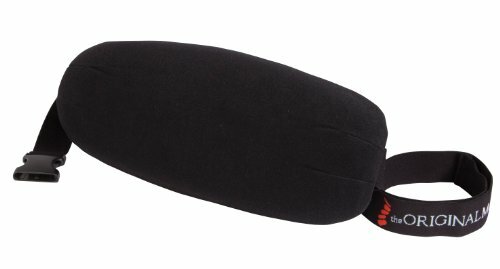 The Memorysoft memory foam back cushion is a great simple pillow support. This is a classic shaped back cushion compared to the Medipaq option above. This cushion is perfect if you need a decent, smart looking lumbar support to use around the office, or even on a luxury car seat. The anatomical design is meant to help follow the angle of the small of the lower back. If you feel that you need a quick fix for a chair vs getting an ergonomic office chair, this will do the job. I do like how neatly tucked away the strap is that goes round the back of a chair. If you feel confused as to which way up or down it needs to go, don’t worry, quite a few people feel the same. You put the wider (thicker) part at the bottom and the more narrow (thinner) edge at the top. Some might feel they like it the other way round for whatever reason. The Memorysoft Lumbar Support cushion is available to buy on Amazon here . There are different reasons people might look at using an ergonomic support, like a cushion. The ultimate goal is to use a product that follows the natural lordosis curvature found in the lower back region. Our seated lumbar spinal curve, when at the proper angle, is designed to evenly distribute our body weight across joints, muscles, discs and ligaments. If this curve is over arching or is too flat, you might get back pain (a.k.a lumbago). This is why a soft chair can make you slump too much by sinking into it. You could also be on a seat that is too hard and uncomfortable so you end up sitting on the edge. Using a portable device, like a lumbar support cushion, can help mitigate the issues that come with prolonged sitting a.k.a 23.5 Hour Disease. Humans are not designed to sit in an office chair all day. That is why so many people who have to work on a computer all day feel they need an ergonomic support. Here are some questions I feel you need to answer before deciding, which product to go ahead & purchase. Who will be using it? A person on a mobility scooter (like in the picture) has different needs compared to an office worker who can get up and down from a chair easily. Same goes for an elderly person in a nursing home vs a younger adult. Is the cushion the right size for you? If you have a smaller frame or body weight then your needs are different to someone who is a plus size in weight or over 6 foot tall. What seat will you use it on? Different cushions can work better on certain types of seats. You can get away with a bulky support on an office chair but it might not fit nicely in a car seat when you are driving. How long will you be sitting at a time? Sitting for short periods means you might be able to need a minimal cushion. However, if you are a IT person who is stuck behind a desk all day then you need something a bit more maybe. How warm is it where you will be using it? Some people might want the see through mesh supports on the market. These are great for not making you sweat on your lower back. However, they lose their shape easily, that is why I didn’t add an option above. I hope this helps guide you where to look for the bets solution. If you need anymore tips check out my how to help a trapped nerve in your lower back page that has more information.